The Krypton Cougars went to district competition Springside Chestnut Hill Academy, ranking 13, and earning a win-loss ratio of 6 to 8. Team 2539 also took home the Creativity Award, sponsored by Xerox. This award recognizes the impressive and creative ways students accomplish tasks, use game objects, or a unique strategy. The tactic or part has to be very original in concept and/or execution. This also includes how they deal with the issues that this strategy or piece has. This also had to contribute to the team's success in FIRST, and not just the playing field. 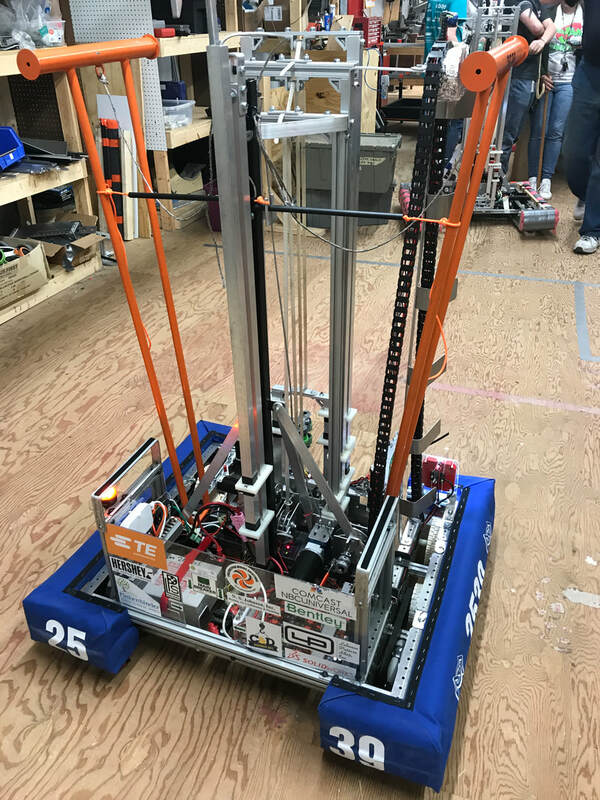 Team 2539, had many successes in the 2018 season in terms of strategy, autonomous, and mechanical features. One of our original and exceptional parts was our 'Iron Cross'. This name refers to the position in gymnastics. We named it this because the two orange, steel bars would drop when we raise our elevator, just enough so another team who might not have had enough to space to climb with us, could still climb on us, looking like this position. We never used this in a competition, even though we have successfully climbed with our practice bot, Hans, at our build site. This was a major engineering feat for our team, and it was certainly original. We took it with us, attached it to our competition bot, Franz, and completed many climbs with it equipped, even though we never used it in a live match. The Iron Cross deployed correctly, it added a creative feature to our robot, showed the judges our engineering skills, and even helped us get to the MAR(Now FMA) Regionals. The judges came to our pits, asked about it, and announced it later that afternoon. We were all very excited, as this was our first award for the 2018 season. Team 2539 is very proud to have received the award for our ingenious Iron Cross idea, and product at 2018 Springside Chestnut Hill. The 'Iron Cross' attached to our 2018 competition robot, Franz.